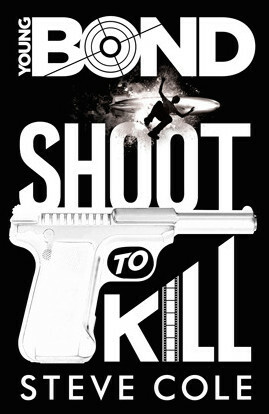 We are now just one month away from publication of Steve Cole's first Young Bond novel, Shoot To Kill. This marks the first new Young Bond adventure since Charlie Higson's 2009 By Royal Command. Says Steve: "It feels quite strange that after keeping this book a secret for so long, in November it will finally be available for all! Of course, it’s already available for pre-order from your favourite book provider if you want to be one of the first to grab it. You won’t BELIEVE how cool the endpapers are…"
In Shoot To Kill, James Bond heads to Hollywood on his first trip to the United States. The book will be released in hardcover in the UK by Random House Children's on November 6. There is no news yet of a U.S. publisher. Pre-order Shoot To Kill from Amazon.co.uk.